Took my camera and the longest zoom lens I have and went for a walk in the snow looking for a good subject for a zoomed in landscape. I thought this one would be easy but it actually proved more challenging than I expected since how do you do a zoomed in landscape and highlight the fact that it’s zoomed in? Eventually I decided to revisit a spot I went to for week 2’s traditional landscape and redo it but this time zoom in and use the trees to frame Signal Hill. It worked out well, obviously a landscape and the trees framing it show I’m zoomed in. Since I’ve visited this spot in Autumn and now Winter maybe I should revisit it again in Spring and Summer to complete the set, a challenge within a challenge. Finally, yes, this is week 14. What happened to week 13? Well I had to skip week 13 since I know exactly what I want to do for that shot but I need some new flash gear that is on it’s way, somewhere between Montreal and here. Yes I could do something else but this is a style of portrait I want to learn so I’m waiting. Hopefully it arrives before Week 15 and I’ll do the shot then. As promised yesterday when I finally posted Week 11, here is the image for Week 12. Since week 13 starts tomorrow this just about puts me back on schedule. This week is Artistic Transportation so I kept an eye out for something different and found it when I went sledding with my daughter. 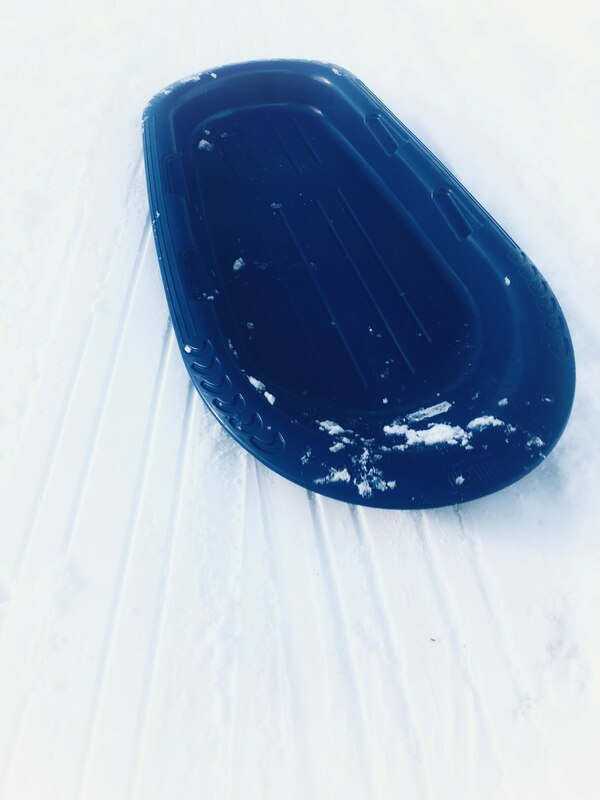 We bought a blue sled and spent some time going down a little hill in our garden. She is 3 and I am Irish so neither of us are experienced sledders, small hills suit us just fine. After a while she got bored and started playing with the snow so I took the chance to take some photos of the sled coming down the hill to try and get just the blue sled on the white snow. Took a few attempts pushing it up the hill with one hand and holding the camera in the other to grab the shots as is slid back down. Got this one which matched what I had in mind, plus had the slide marks in the snow to give some context. This one is very late. I should have posted it before Christmas but with all the holiday commitments, a photoshoot and just being laid back over the holidays I couldn’t find a suitable subject. A couple of months ago I was surrounded by mirror smooth ponds and loads of reflections. Now the ponds are frozen and snow covered and all the glass seems to have a layer of salt. 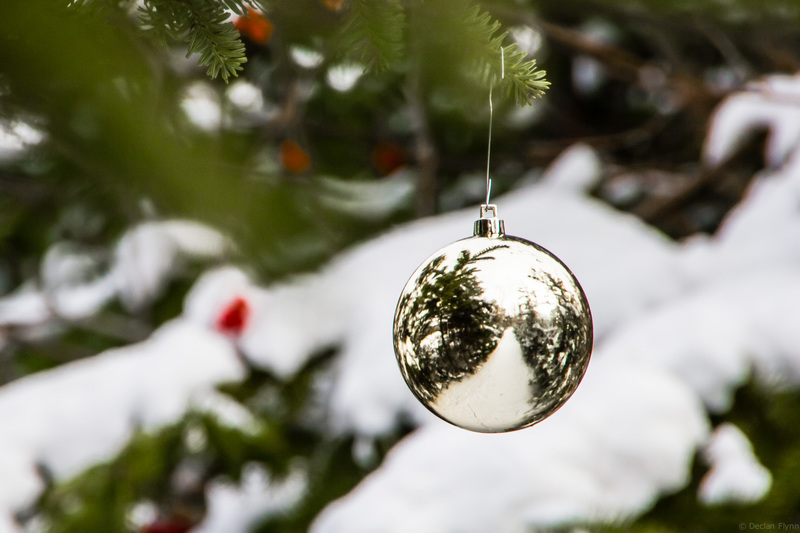 Last night I went to our local camera club (Camera35) and one of the other members had taken a self portrait at home reflected in a Christmas ornament on his tree. That gave me the idea for this shot. I took a ball from the tree at home and hung it on a tree on a path near work. I’ve already got the next photo, I was waiting to get this one and post them in the correct order, but I’ll post that tomorrow. 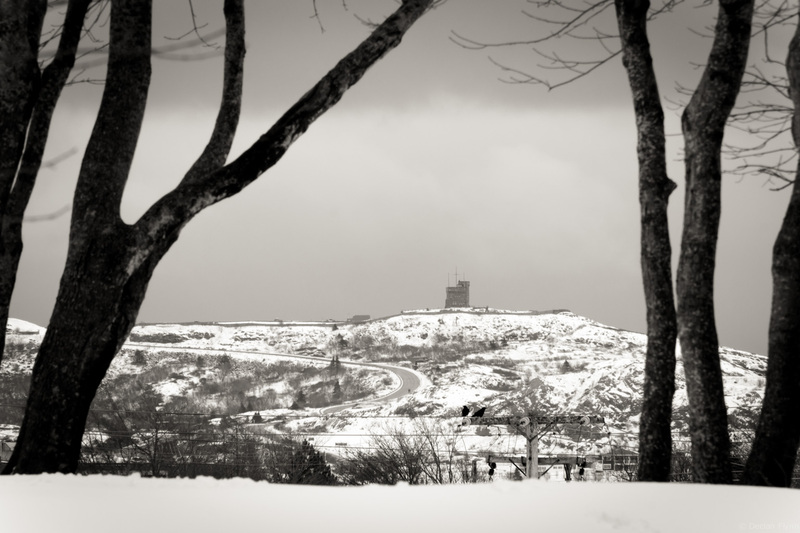 The first proper snow of the winter fell last night. It’s just the start and if the forecast is correct it’ll probably be gone by the weekend but it was enough to get me out at lunch time to take some photos around work. The snow isn’t deep but it’s cold, -15 wind chill. 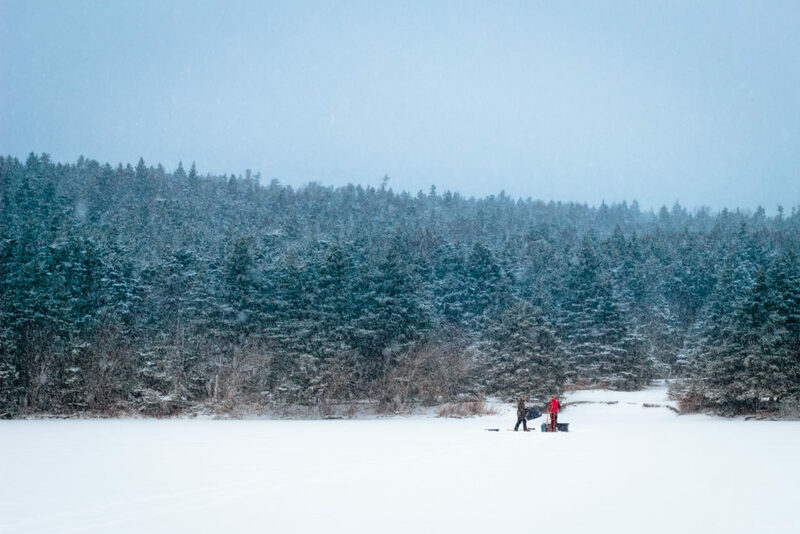 As the winter goes on the lake will freeze over, last year people played hockey on it. I’m hoping to get some photos if something similar happens this year. 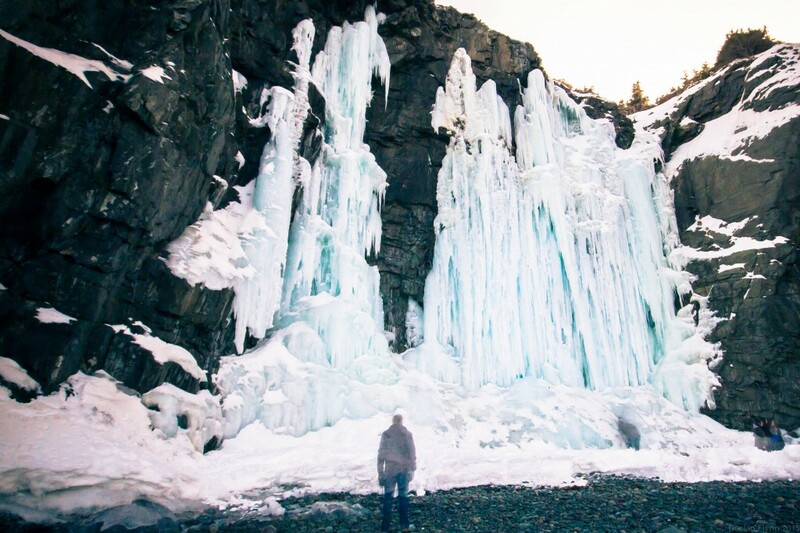 One of the local novelty attractions of the year is the frozen waterfall down at Middle Cove beach. I finally got down to it at the weekend to take some shots before it melted. Unfortunately many others had the same idea and there was a constant flow of people taking photos and selfies in front of the falls. Thankfully I had thrown my long exposure filters in the bag before leaving and decided to set up for 2 minute exposures which blurred out most of the people except those who stood in the same spot. That happened in this shot but what was weird was the fact that it appears the person standing in the shot didn’t move a muscle for at least a minute of the two. I don’t remember anyone like that, a couple of other photographers with monopods and the like but none where someone just stood arms at their sides. It’s a bit spooky. On a side note, I recently had a bit of a problem with my WordPress installs, they got wiped in an upgrade and though my hosting provider manager to restore from their own backups I still took the opportunity to revamp the template for my blog. Then because I am a real glutton for punishment I decided to reformat my laptop so it took me a while to get back up to speed again, especially since I forgot to copy over my Lightroom Presets and Templates, which are not stored with the catalogs, so I had to go hunting through Time Machine backups. Lesson learned.